Back in March we brought you the announcement of two new headphone releases from Sony: the Sony DR-350USB and DR-320DPV headsets and now after having had the chance to put them through their paces here is a more in depth look at the DR-350USB, and seeing as we had a look at the Sony MDR-570LP headphones not that long ago we’ll have a quick comparison with the two. Aiming to appeal to those that use a microphone at home as well as listen to music on the move the detachable microphone on these Sony DR-350USB headphones is their real selling point, but will they ultimately prove to be a ‘jack of all trades and master of none’? We’ll see. Alike the MDR-570 headphones these are not ‘cupped’ headphones and thus the first things I was looking for was a lack of bass, large amounts of sound leakage and generally poor quality but much akin to the other Sony headphones it succumbed to none of these problems… to a degree. There was certainly no problem with the sound quality which was really top notch, and I was very impressed with how it coped with the full range of bass and treble sounds. Admittedly the bass is perhaps not quite as good the MDR-570s but the difference is really minimal and is probably more to do with the fact that the DR-350s sit a lot lighter on your ears. There are however improvements with the treble which is no longer lost at all, and gives a slightly better overall sound quality which sets the DR-350s off to a good start. I would however say that the headphones to leak a little more sound than its sister, enough to start to annoy the person next to you if they are off your head for an extended period of time. 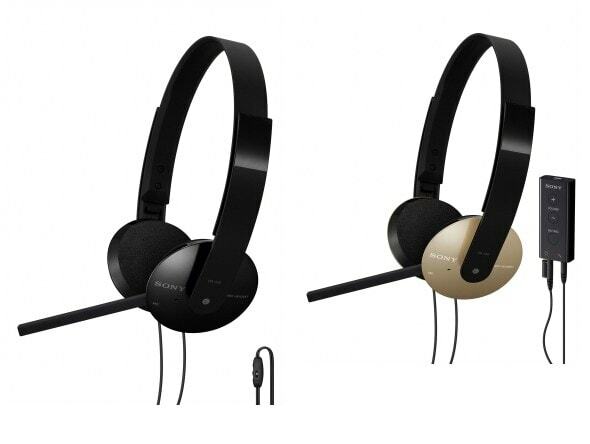 With regards to both of these criterions the DR-350s are classic Sony: claiming to be the “stylish alternative to flimsy, drab looking headsets” they certainly fulfil the first part of that with the slim, smooth and ultimately quite discrete design which comes in a range of colours which you can, if you are that way inclined, choose to match your VIAO laptop if you own one. I personally tested the gold coloured headset which is a colour that I probably wouldn’t choose but was by no means brash enough to stand out at all. The design is very nice to look at with all sleek lines to hide the inner adjustment workings, which are very smooth and easy to use. Build-wise it is also impressive with the actual ear-pads sitting on small fittings that have the ability to partially rotate to sit better on the head, although this does mean that they do not fold back around like the MDR-570s which does make them less portable and more likely to break, and the slightly-too-thin wires don’t help that problem. However there are a couple of nice features with regards to its connections: the first being the obvious in that it has USB capabilities which as Sony say allows you to “Experience clearer sound and greater noise reduction via the USB adaptor” and whilst I would say the difference isn’t really that big at all it is nice to free up the microphone/speaker jacks on the back of your PC when you use it for that, and depending on your keyboard the inline controls may prove useful. The second is the small addition of a plastic socket aside the speaker jack into which you can put the microphone jack when you are not using it which saves quite a bit of hassle, increases the longevity of said connector (by not allowing it to get caught on anything) and proves its classification as an all-round headset. That leads us nicely onto discussing the microphone which is perhaps the best bit of the headset. Whilst the external omni-directional microphone does allow you to use the microphone without the tube it has a tendency to pick up a lot of background noise which isn’t really surprising considering its placing. So assuming you haven’t already lost it or accidentally thrown it out (which is surprisingly easy to do as it just looks like an odd piece of rubber) you will be wanting to use the tube with is essentially a cheap version of the ‘pull out’ microphones that we have seen on previous headsets and allows you to channel your voice into the microphone. Unfortunately despite being a good idea, and allowing the headset to be universally useful, there is very little one can say about the microphone. It is by no means remarkable in either the quality, or lack of it and manages to be incredible in the way it is ‘middle of the road’. Even with the tube you do tend to pick up a bit more background noise than you would like, but the quality is good enough to make up for it and people will have no trouble hearing and understanding you even if it is not as clear as it could be. 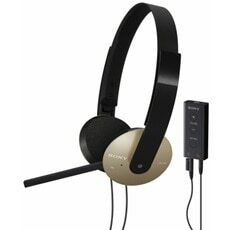 Despite the fact that it took me a while to get used to the Sony DR-350USB headset (there is in fact a ‘knack’ to wearing them to ensure they don’t fall off) I have to say I was impressed by the headphones and the manner in which they manage to bridge the gap between a headset and portable headphones. Although they are omni-purpose these may not be for you: if you don’t use microphones at all or have a desk one then I would advise you to definitely go more down the route of the impressive MDR-570s that we saw before, and if you use your microphone a lot for the likes of VOIP or gaming then you may want to spend the money and get a headset more designed for this. But if you are anywhere in between which I imagine a lot of people are then these are for you. At £49.99 they are hardly a bargain but when you consider that they are essentially two headphones in one then they definitely seem to be good value for money, and you won’t be disappointed!